Back in May I spent much of a day searching Montezuma Canyon for rock art. I managed to find quite a few panels that day and am sure that I also missed quite a bit. One of my favorite panels I visited that day was this petroglyph panel depicting four cranes (or maybe some other kind of long-legged water birds). 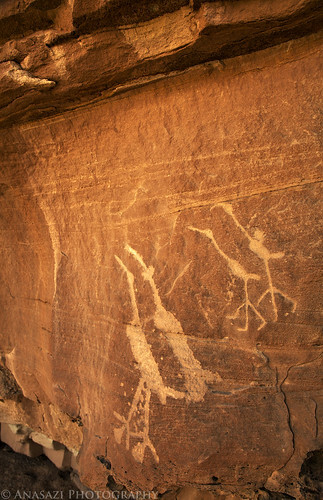 There were also plenty of other petroglyphs in the immediate area to explore.